Our Latex Mattress bed frames are complemented by our accessory kits which form part of our integrated design system. These kits expand the range of aesthetic options and functionality of all our beds. 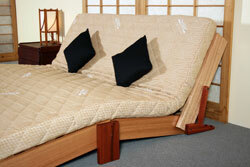 The three Kyaku Sofa Bed Accessory Kits are designed to increase the functionality of the Kyaku Sofa Bed range. The Kyaku Sofa Bed frame is fully provisioned for all the kits, so a kit can be purchased initially or at any time. You can use all the kits together without affecting the function of any of the kits; we call this function in harmony. 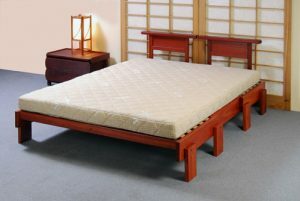 We recommend the 12cm thick Latex Mattress for the Kyaku Sofa Bed design. You can use the 17cm thick Latex Mattress if you intend to use just the bed and recliner positions, but for the compact sofa position the bending of the mattress is not a easy with the 17cm thick mattress. Our Recliner Kit enables you to convert the Kyaku Sofa Bed frame from the bed or compact sofa position to a reclining or banana chair position in seconds. Great for reading a book, watching television or just relaxing with your legs stretched out. Our Height Kit allows you to elevate the Kyaku Sofa Bed frame to the height of a normal bed. You can also use it to elevate the couch to 3 different height positions and choose over ten possible contour positions for sleeping. Our Arm Head Board Kit can be used as a full-width head board for the bed position or you can quickly convert it to arms for the sofa position. The two Arm Head Board Kit types available are: 190mm or 140mm wide, and they both have two head board height options. The ends of the arm-head board tops can be angled or rounded and can be fully reversed for different aesthetic style. Also, the arm- head board panels can be a two tone colour on one side and matching on the other, allowing you at any time the interest of a contrasting aesthetic. 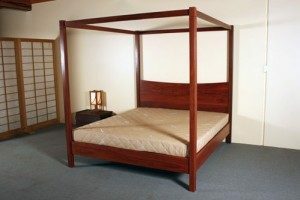 You can change or add at any time any of the feature legs, balls, castors or support bearers to any of our Box frames and Tassha Lounge Bed frames, using our Multi Block Kit. You can get this kit with your initial purchase or at any time. The Multi Block Kit is completely concealed behind the frame and is not seen; its purpose is functional only. Multi Blocks provide a set-back position which is suited to the wider feature legs and they also enable attachment of the legs in various positions, for example further inwards creating a more suspended look or towards the ends of the end boards for a spanned look. Capping Board Block Kits enable you to add a Capping Board to your head board without the head board height being compromised. Capping blocks are fitted to the bottom of the capping board, which is then cam-bolted to the provision in the upright of the head board. 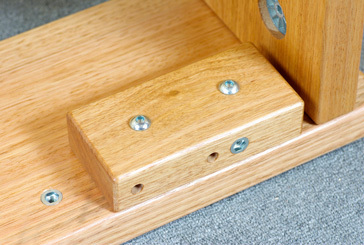 With most models you can also fit capping boards directly to the head board uprights, in which case capping blocks would not be required, but the head board would be 70mm lower. Canopy Kits consist of 2 end canopy rails, 2 side canopy rails and 4 feature blocks. These form a canopy when fitted to the top of the Zenith Poster frame. The canopy can be left as-is, producing the clean lines of modern aesthetics or you can dress it up to your taste with romantic lace or bed curtains.